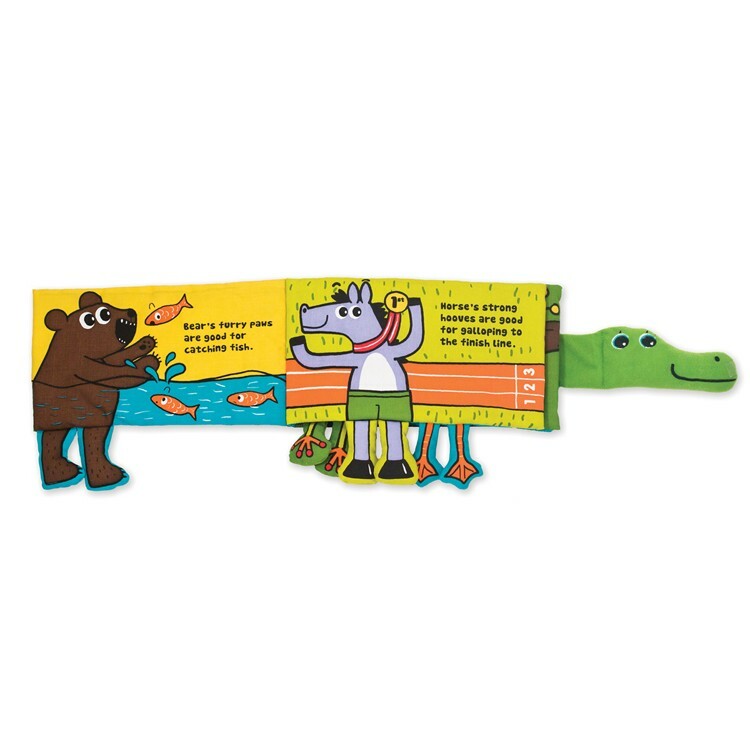 Help the smiling crocodile find his feet turning the pages of this adorable first activity soft book by K's Kids. 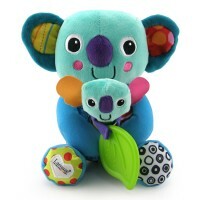 K's Kids collection added another great baby activity toy - this adorable soft book. 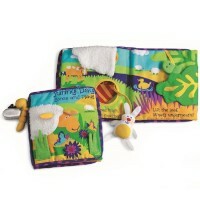 Baby Activity Soft Book - Whose Feet? 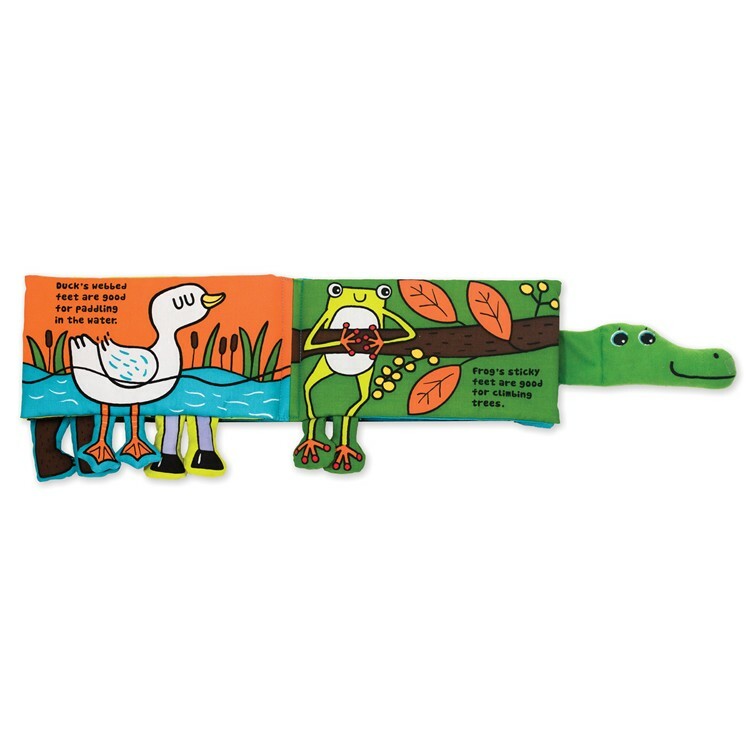 by Melissa & Doug brings the first book for infants to learn and play with. 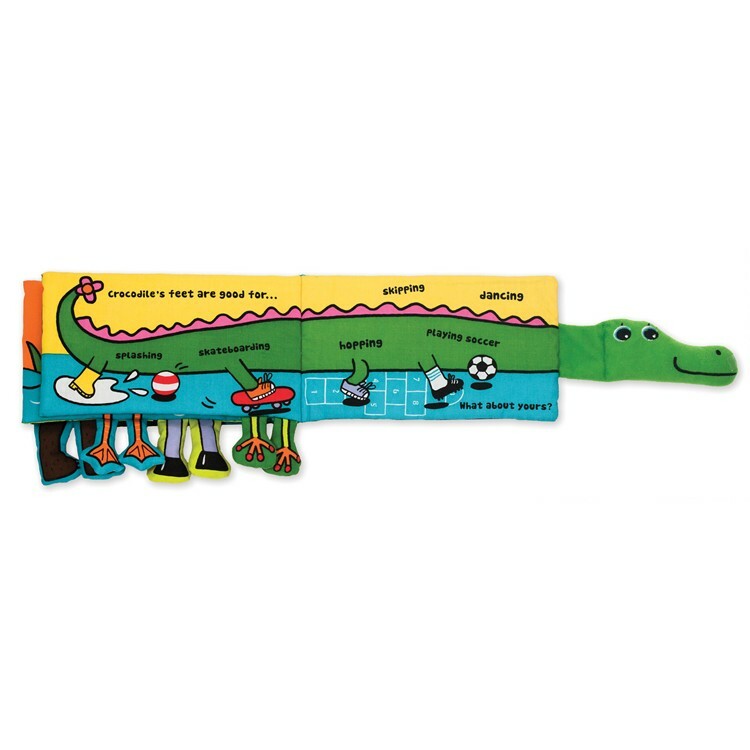 This fabric-made book features a friendly crocodile that is looking for the right feet. 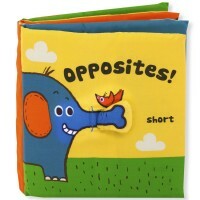 Turn the pages for your little one and show the pictures of the cute animal friends with different feet. All the animal feet unfold down to encourage grasping them. Baby Activity Soft Book - Whose Feet? is full of developmental features. 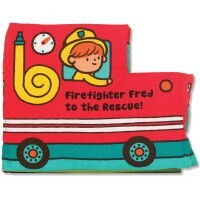 This baby soft book from Educational Toys Planet squeaks, crinkles, and offers terrific activities for the small hands. 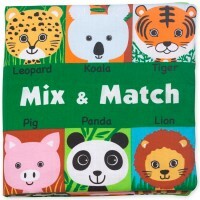 This adorable foot-fun infant cloth book features simple to read and explain text, bold colors and kids-friendly illustrations of popular animals. Packed in the transparent vinyl bag with carrying handle, this infant activity toy is a great item to keep in your diaper bag or baby stroller. 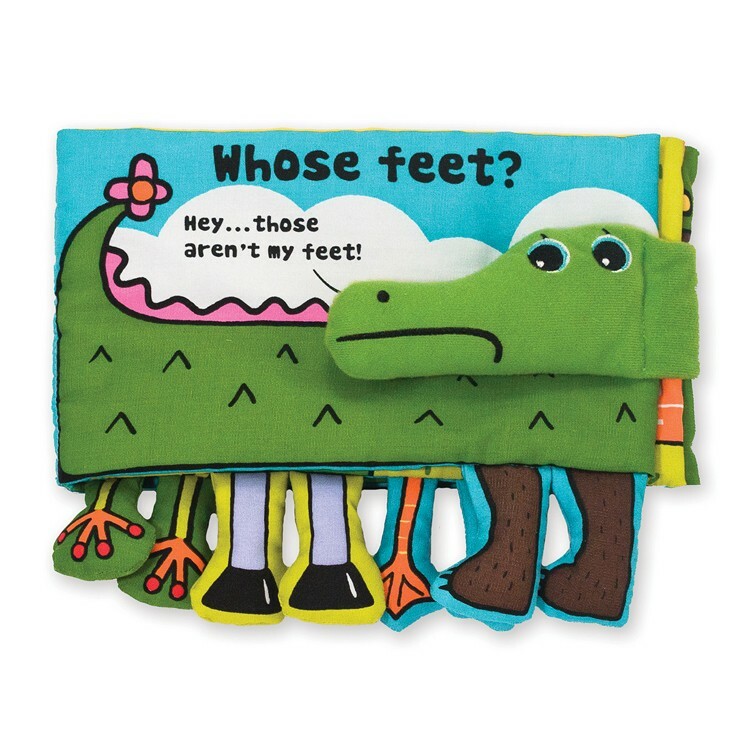 Baby Activity Soft Book - Whose Feet? 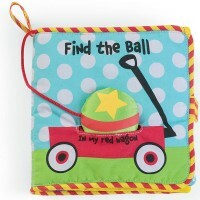 is easy to clean - just throw it in the washer and let your baby play with the activity book again and again! Dimensions of package 9" x 2" x 10"
Reviews of Baby Activity Soft Book - Whose Feet? Write your own review of Baby Activity Soft Book - Whose Feet?. Rating: 5 Awesome full face phone protection! by By A customer This screen protector is amazing! It was my first experience with a full face protector, and I will never go back to the smaller type. The first screen protector in the pack lasted over a month until a drop caused a small crack along the top. I continued to use it for several days since I was away from home at the time. When I returned home and removed it I was pleased to find that my phone's screen was still in perfect condition. The accessory items that came with the protector made it very easy to install it myself, and it went on perfectly with no problems at all. I will always have an extra on hand. Rating: 5 Great Book by By A customer My 4 month old niece loved this book. 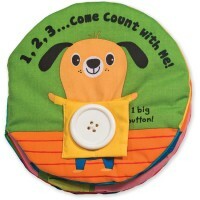 Great soft fabric option for when it goes in the mouth and get chewed on, and also good basic reading fun. The legs are easy to grasp with just the right amount of "crinkle". 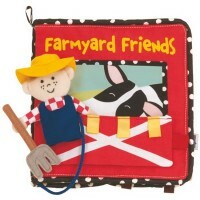 Rating: 5 Love Melissa and Doug products by By A customer Cute book. My daughter just likes flipping pages. Rating: 3 Unimpressed by By A customer Bought this for my 14 month old who has a habit of eating all of her board books. Cloth book solves that problem but this book is not impressive. The feet of each animal appear on the next page with no explanation. They didn't design them to appear different on the next page or draw the other animal, etc. The crocodile feet do not dangle at all. Nothing charming or compelling in the story. Rating: 5 Almost have them all by By A customer I think i have bought every book Melissa & Doug make. These are great starter books for my daughter and she just loves them. 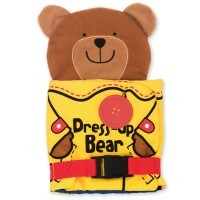 Rating: 5 Great for little hands by By A customer Got this for my grandson who is one. He loved all the legs.